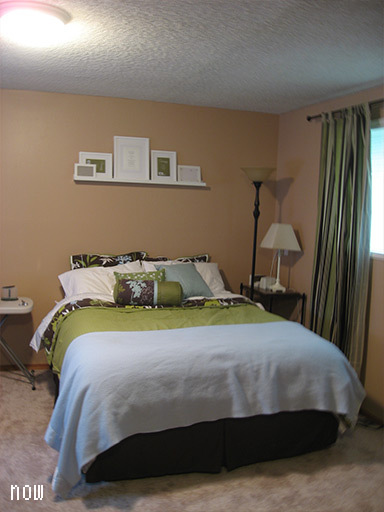 First stop, the guest bed! Our computer room does double duty as both a guest room and, well, a computer room. This works out surprisingly well. We both love flopping down on a bed to read while the other sits at a computer! I mounted a thin picture shelf we snagged from IKEA a few weekends ago over the bed like so, which became home to several of the recently-homeless frames. Getting the shelf up was easy – just three screws to drill in. 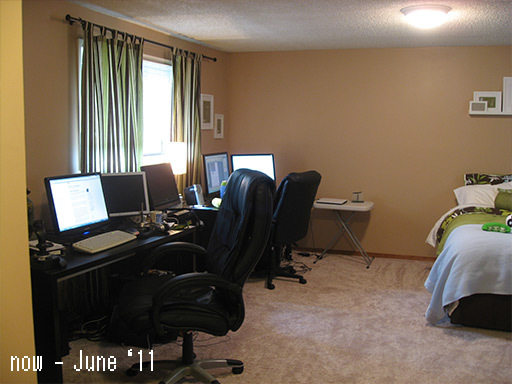 (I also made the bed and cleared off the last few week’s worth of papers. It also doubles as a huge desk for papers that ought to be filed.) The frames sit in the shelf very nicely. Using a few small nails I hung some slim IKEA frames like so next to the back window. I just made up the arrangement as I went and it turned out ok! I left one nail in the center to hang something small from. 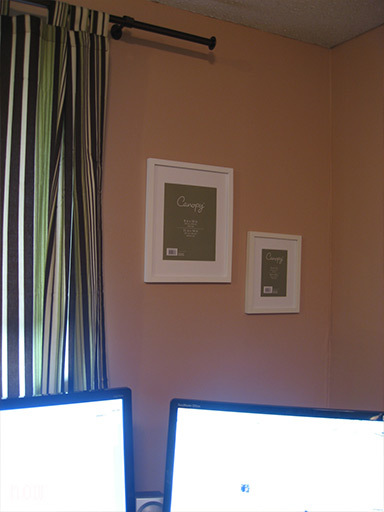 The frames are too slim/small to use the usual picture hanging hooks, but nails worked fine for getting them flush with the wall. And in the corner near my computers I hung two more frames, this time hung with actual picture mounting hardware instead of nails. 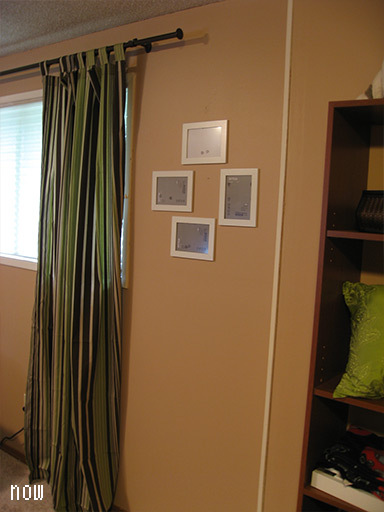 Below is my in-home tanning bed… I mean, computer screens! … with some frames to fill in the empty corner behind them. There we go! Much better on the wall than in piles around the floor. 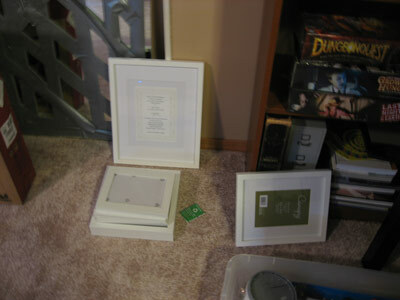 But in solving my picture-frame-pile problem I created a new one: what to put inside the frames! For now, the room is decorated with Canopy and IKEA logos but that’ll change soon. Walgreen’s lets you submit photos online to pick up at any store, printed at any size, so I think I’ll end up picking a few of our favorites and having ’em printed large for the big frames. That’s how these projects always go when the time for working on ’em is somewhat limited: do a bit, do other stuff, then come back and do a bit more. 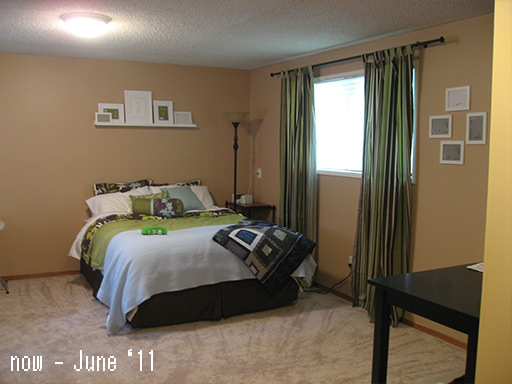 On the bright side, at least the room’s walls aren’t stark naked anymore!